Recently I have noticed a couple of very high sales prices for properties in east Los Gatos with Union Schools, especially Alta Vista, Carlton, and Noddin schools. 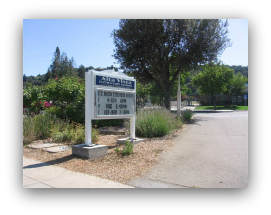 It should be noted that ALL of the elementary and middle schools throughout Los Gatos, Monte Sereno, and the Los Gatos Mountains are very strong and can boast excellent school test scores, notably good parental involvement, and pleasant campuses. 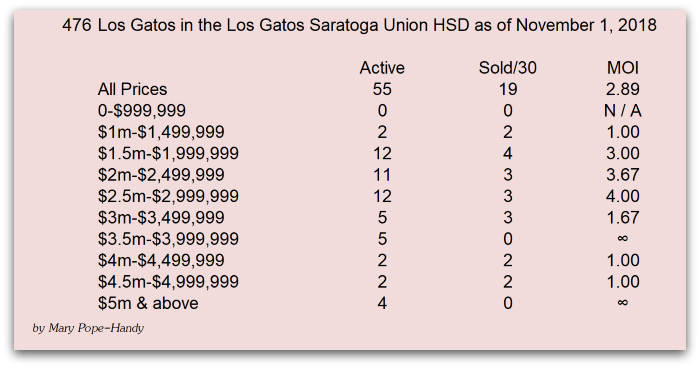 Even so, homes closest to downtown Los Gatos and with the Los Gatos Union School District have always sold for a noticeable amount more than those outside of that area. Often the delta is 10-20%, but it can very a lot. On a couple of occasions recently, though, it seemed like at least some homes selling in the Union or Campbell schools are were gleaning prices more typically seen closer to downtown. So I started to wonder – Is the gap between the two major areas (in the schools / not in the schools) shrinking? Let’s see by running the numbers in the MLS for one or two segments of the market. The search I created was for houses in Los Gatos (not Monte Sereno or San Jose on the border), zip codes 95030, 95032 (sorry, Los Gatos Mountains not included in this study); home age 20-60 years, lot size 6,000 to 10,000 SF. These are “normal homes” and not luxury or estate properties, of course. Sorting out the local Los Gatos real estate market can be a bit tricky, but one of the best instruments for measuring performance is the months of inventory (MOI, or absorption rate). In this article we’ll consider the MOI houses in Los Gatos 95030 and 95032 by high school district and price point, since I believe those are the two main drivers of our residential real estate market. Also, this time I’m adding in the pending sales as an indicator of where the market is going, too – just to cover the bases! Finally, since I did a similar study the first week in November, but without the pendings, I’ll keep those below the current tables for the sake of comparison. Overall, right now we have a brisk 2 months of inventory for houses in Los Gatos. But homes in the lowest price point are selling far faster – at about 10 days of inventory!! The MOI increases very clearly with higher price points, where it becomes increasingly challenging to sell. About six weeks earlier, it looked like this chart below -the MOI is now a lot faster (4.19 then to 2.04 now) as inventory has shrunk by about a third and sales have increased (21 to 28 now). Perhaps most striking is the change in the luxury or high end market over the last six weeks. It seems far harder to sell a luxury home now as opposed to then. Next up – homes “in the schools” with Los Gatos High School, then those in the Leigh HS and Westmont HS attendance areas. How will these numbers stack up compared to the town as a whole? How’s The Los Gatos Real Estate Market Doing Now? 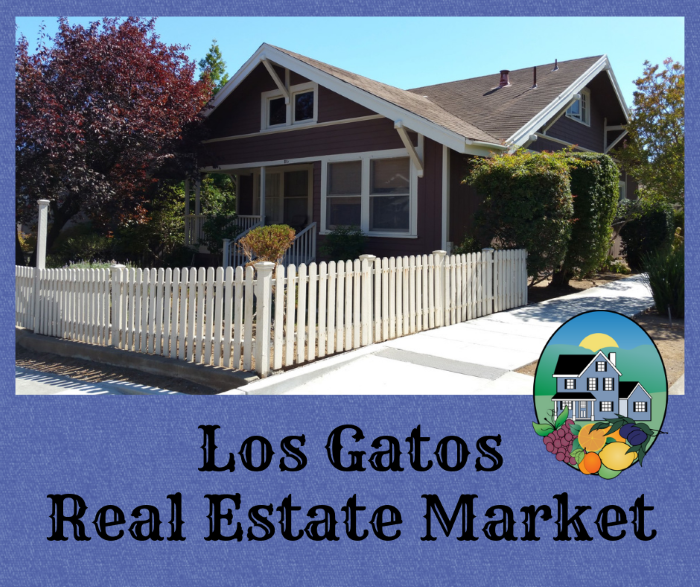 The market is heating up in Los Gatos as of about 4 weeks ago with new sales commenced. 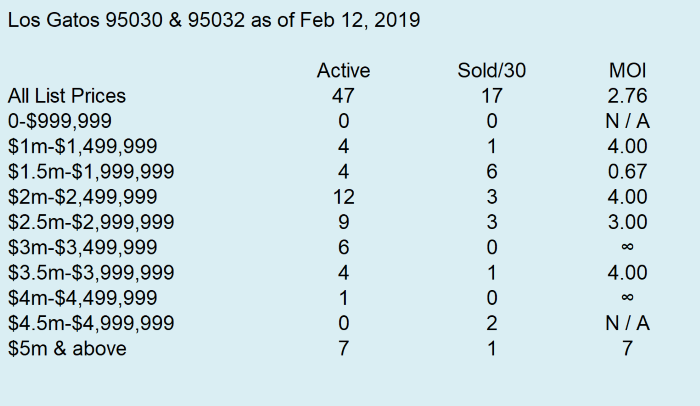 These will not be reflected in the closed sales until early March, so please take the ‘solds’ info below with a grain of salt and keep the changed market conditions in mind! 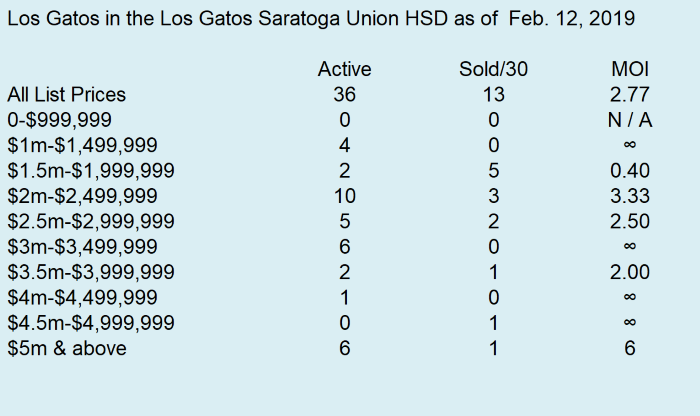 Below please find the statistics and numbers for house sales in the town of Los Gatos (95030 and 95032), including county pockets, which closed in the month of February 2013. The median price is down both month over month and also year over year. It has been softer in Los Gatos than in many Silicon Valley communities right now. Inventory is low all over – and Los Gatos is no exception, though inventory did go up a bit countywide from January 2013 to Feb 2013. How bad is it? Off 30% from a year ago (and inventory was low then: Feb 2012 was 86, Feb 2011 was 132 available houses). Days on market: The figure for February of 88 days on market for sold properties reflects the DOM of houses that closed in February and most likely went into contract in January, or possibly December – both of which were “cooler” times than the shift we saw take place in early February 2013. How long have the currently available single family homes in LG been on the market? How long were the under contract single family homes in LG on the market? 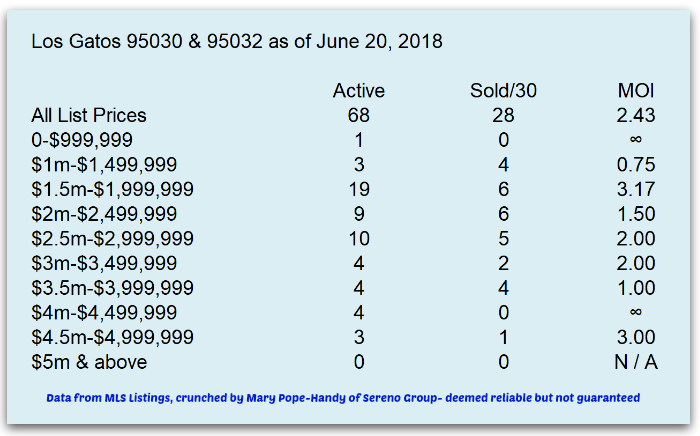 I won’t repeat this level of detail for the Los Gatos houses which are sale pending or under contract (real estate agents: status 3 & 4), but the average days on market for those 17 pending properties is 26 and of these, only 2 were more than 30 days (1 sold with 49 DOM and another 191 DOM). In other words, when homes sell now, they are selling faster than the DOM from the closed sales in February would reveal. This will show up in March’s statistics next month. Are there multiple offers in Los Gatos, and overbids? Dramatic improvement in the median and average sales price of condos and townhomes in town year over year as well as from the prior month. The Los Gatos Mountains real estate market trends and statistics – 95033 – houses, no condos or townhouses only – NO HOMES SOLD/CLOSED in Feb 2013, so no charts to share! A more affordable, but beautiful, place to live is in the coastal foothills over the town of Los Gatos. The communities there are closely affiliated with the town of Los Gatos, if distinct! This area is always tougher to sell, and slower to appreciate. Prices here aren’t much better, and possibly worse off (depending on the area, price point etc. ), than a year ago. Next please enjoy the live Altos charts, which are updated automatically each week – each segment is a little different than the others (and the reports would be more diverse still if we broke these down further, by price quartile – – sign up below if you want these delivered to you via email each week). As you can see, pricing is stronger in 95030 than in 95032. This may be due to the schools (only a little of 95030 is in the Campbell Union High School District, but a larger portion of 95032 is). The strong Los Gatos schools are a major driver of desireability – but not the only one. Many people want to have the “walk to town” element, even if their kids are in private schools. 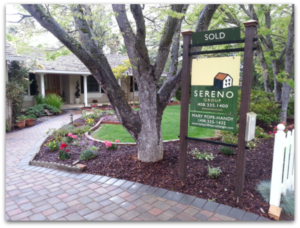 What Is Selling in Los Gatos Now? Here are some quick facts regarding the 29 homes which have closed escrow in the last month. How fast are homes selling in Los Gatos? All DOM at or under a month = 17 = 59% of the sales. So the odds are very good that if your home is priced right, it will sell in the first 1-3 weeks on the market. The most sales of these “sold quickly” homes happened in the very first week. What about all the homes that have not sold? What can the owners learn from this? First, your best chance of selling is early on in the listing period. If you get to the one month mark, the chances begin diminishing that you can sell without a price change. Do everything you can to make your home turnkey and super accessible that very first week or two especially! What is key to sales success is generating a good amount of qualified traffic, again especially early in the game. In Los Gatos, having open houses and having the home open for the broker’s tour are both important (at least initially – less so after 2 or 3 weeks on the market). If you are not getting at least 3 to 5 showings per week, you may have a problem. (Disclaimer: this is “in general” and may not apply to luxury estates and certain other properties.) Having overly restrictive showing schedules makes it hard to show and hard to sell. For homes priced below $2,000,000 it is really not a bad market right now for sellers or buyers – it is pretty balanced overall. In some areas there’s more competition then sellers would prefer, but in general these homes are moving when priced right, nicely staged and well marketed. 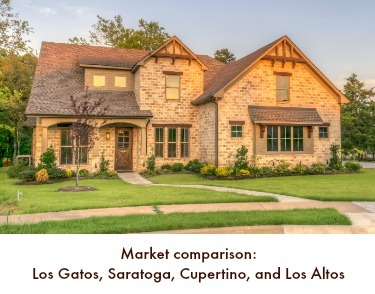 The Los Gatos real estate market varies between the price points, areas, school districts and zip codes (and, where present, sale type – regular sale vs short sale or bank owned home). Today we’ll update the market info for the homes for sale in Los Gatos (houses and duet homes, not the condo or townhome market). 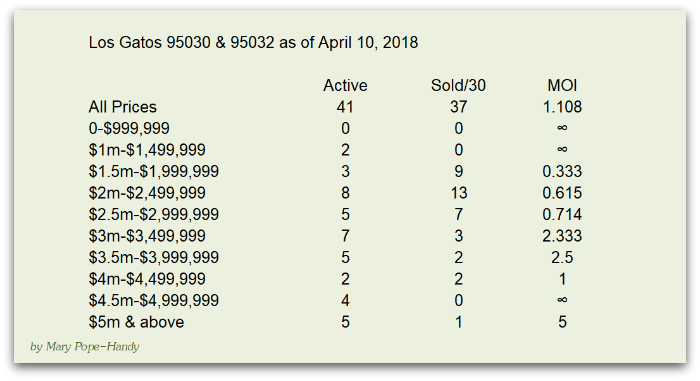 First, here’s some data from my RE Report subscription for May sales in Los Gatos. (You can see the whole online report here.) 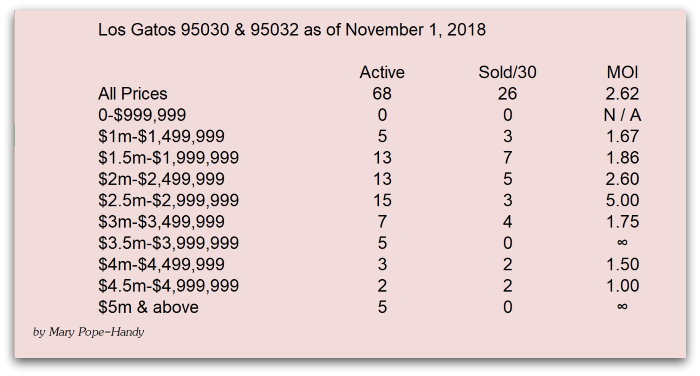 To get the months of inventory or absorption rate, simply divide the active listings by the solds in the month – so 156/29 = 5.37 months of inventory for Los Gatos. It is just slightly inside the definition for being a seller’s market (6 months is balanced, less is a seller’s market and more is a buyer’s market). It is close to a balanced market in Los Gatos overall. Let’s start with the numbers for the Los Gatos 95030 zip code area by price quartile. Median price here refers to the median LIST price, not sold price. The quartiles each reference 25% of the market. The first quartile is the most expensive segment and the 4th is the least. What I find really helpful with this view is what size of home your money can buy and on what lot size. Let’s next look at pricing trends by Los Gatos zip code next. First is the 95030 zip code area of Los Gatos with the median list prices for the last year. Hurt the most is the luxury market. Lastly, a look at the trend for “days on market” (DOM) of homes for sale in Los Gatos over the last year. Has it gotten harder or easier to sell in the last 12 months in 95030 and 95032? For this part of Los Gatos, which tends to be the most expensive part of town, the DOM was rising until about March for all price points, then suddenly began to fall. A market reversal? Interestingly, the days on market for 95032 has seemed to be a lot less volatile with one exception: the most expensive homes in the 95032 zip code. As a group, the DOM for 95032 is longer now than a year ago, which is also true for the 95030 part of town. the recent movement has been downward, though, and this also changed starting at about March 1st for most parts of town. Overall, it is close to a balanced market in Los Gatos. Depending on the price point, zip code, school district and more, it could be a “hot seller’s market” or a “cold buyer’s market”. If you are buying or selling a home in Los Gatos, it is very important to drill down to the micro-market that applies to your home to understand how to price your home to sell or how to structure your offer price to buy. Feel free to shoot me an email or call me to chat about your buying & selling plans. Please also check out my Valley of Heart’s Delight blog for comparative market info. The Silicon Valley Real Estate Report, including data for Los Gatos homes for sale and sold in November, is now ready. Below please find a summary for the key points and a link to view the entire report. Click the following link to see the whole online report for Los Gatos townhomes and condominiums. For the Los Gatos single family home market, there’s noticeable improvement. Inventory is declining, prices are nudging up from earlier this year (and also from a year ago in many parts of the local market). The trend appears to be moving toward a more balanced market overall. There remain some mixed indicators, though – hinting that the recovery is not happening uniformly across all price points, neighborhoods, etc. To read the entire report online, please click on the following link to visit my Real Estate Report for Los Gatos houses and estates. The median price for single family, re-sale homes (houses and duet homes) surpassed $600,000 for the first time since August 2008. Inventory remained in a downward trend in November: down 66.7% compared to November 2008. Pending sales were up a whopping 90.4% year-over-year. There is also a 4 page printable version with more articles here: http://rereport.com/scc/print/Mary.PopeHandySCC.pdf. Please contact me for assistance with your particular situation & area.